Just in time for Mother’s Day, we’ve got some ideas on what you can do around the house to show Mom you truly care, all presented in President Steve Barkhouse’s latest appearance on CTV News at Noon with Leanne Cusack. First up, a condo renovation that transformed an industrial space into a beautiful, feminine retreat. Obviously, a full-home remodel is not possible by Mother’s Day, but there are some great ideas here that can be applied to any space, should you want to help Mom create her own little oasis. The owner of this Westboro condo loved the characteristics of the space when she bought it, but she knew the style was not “her”. Built by Domicile, it had great “bones” but the design did not match her aesthetic. Before: Red, high-gloss cabinets overtook the kitchen & drew the eye downwards, away from the great high ceilings. Before: Dark finishes set a more traditionally masculine tone & the industrial style didn’t match the owner’s. Before: The den had potential, but lacked personality and a focus. Before: The bedroom was a good size, but plain and the potential of the oversized doorways was neglected. All in all, the owner knew she needed an update. She also knew her design style, which can make a big difference in how the project comes together. The first major change we made was to white out the entire kitchen to create a more tranquil space. We kept the white quartz waterfall countertop, but removed all of the red and grey. 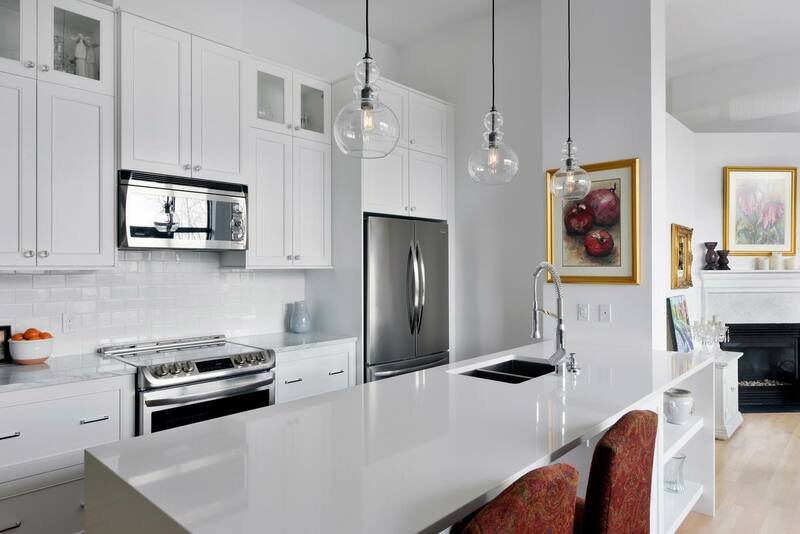 Extra details, like glass-front cabinets and simple glass pendants, add a feminine touch. It’s a minimalist styling that invites calm. Not only did we white out the kitchen, we painted out the entire space. Simply painting the ceilings and ductwork in white adds height and an airiness to the space. Glass light fixtures carry from the kitchen to the dining room to maintain openness, as you can easily see right through them. We also grounded the kitchen with black lower cabinets to maintain distinction in the space while tying them into smaller black details throughout the rest of the home. The grey fireplace surround was replaced with a white mosaic tile while a small mantel ledge that was added to allow the owner to display décor. Incorporating built-in shelving offers further storage and display space. In the den, we created a more unified space with a simple, yet elegant, look. 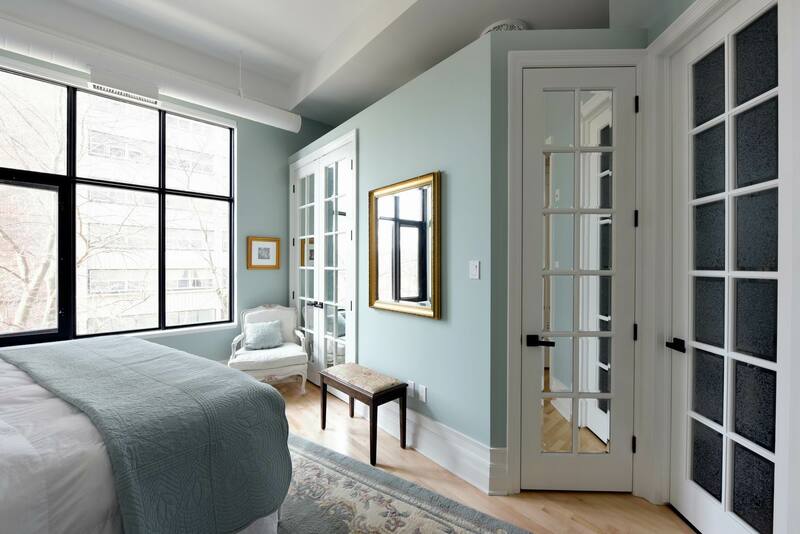 Custom mirrored French doors replaced the existing flat panel doors, while additional mirrors help open the space by reflecting light. Both a ceiling fixture and medallion were added, with the crystal chandelier continuing the glass accents. A single, surprising pop of blue is a welcome addition and adds a little character to this small room. Moving into the bedroom, while we added colour, we also created a much more feminine and tranquil space. 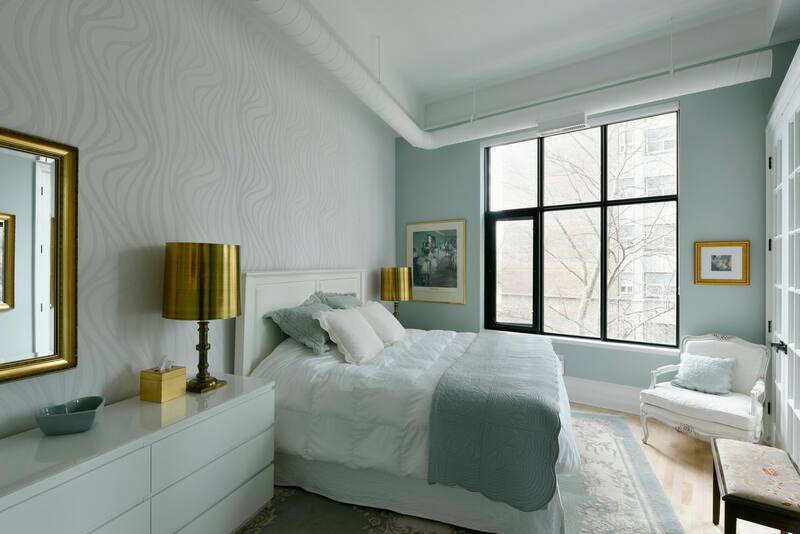 The light blue walls are serene and calming. Rather than extend the colour to the ceiling, we kept the airy white ceilings by dropping a line of trim about a foot down, and painting the upper portion white. 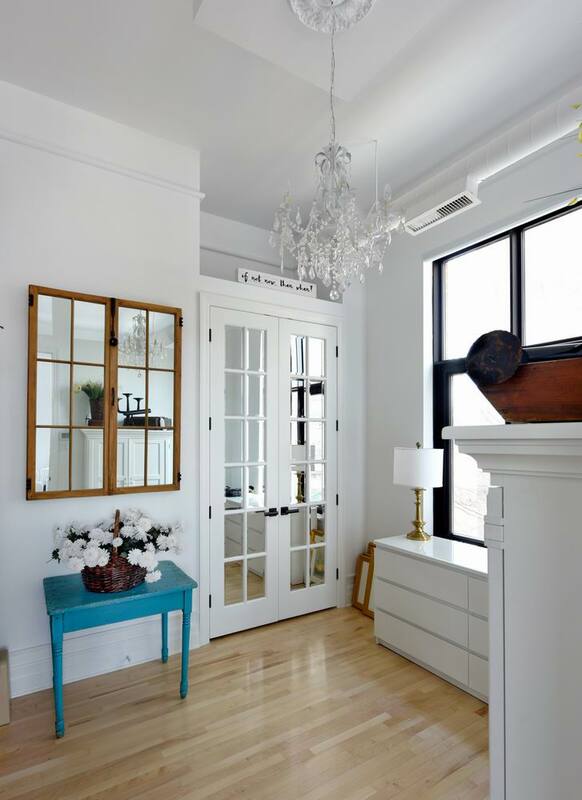 We added a touch of glamour by swapping out those flat panel doors on the closet and ensuite with custom French mirror doors and new black hardware. 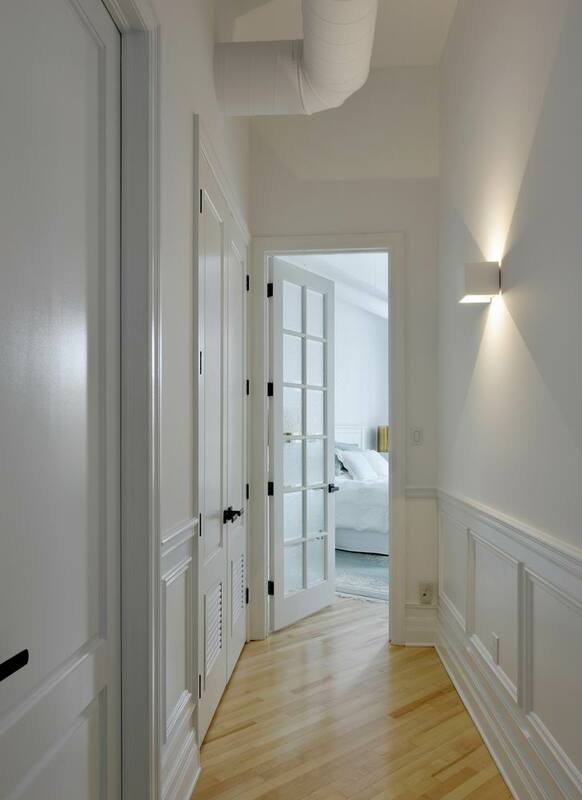 And finally, never one to overlook a space, we also considered this simple hallway that led to the bedroom. Taking advantage of the ceiling height, white paint does wonders to elevate and create openness. But we also wanted to add visual interest, which is done by adding trim to create a wainscotting effect, creating glamour and texture in an otherwise overlooked area. Overall, the owner now has a beautiful, serene home that feels like her own. 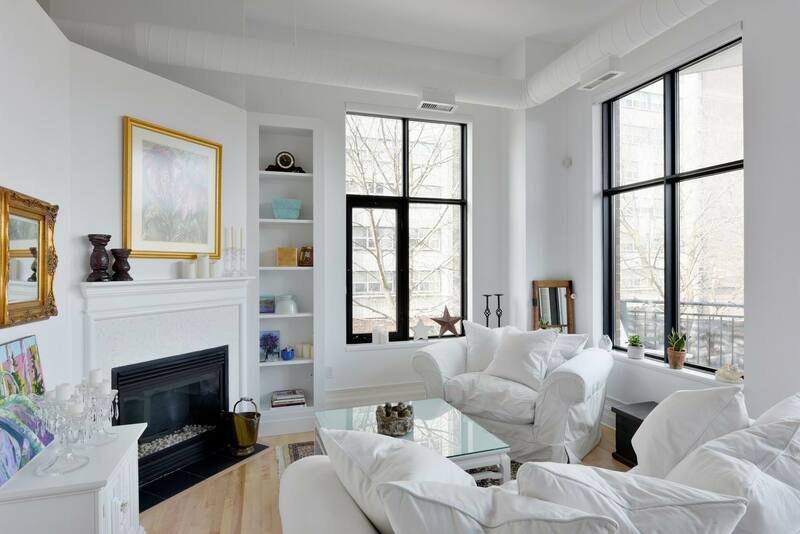 Painting the entire space white provided a blank canvas for the simple touches that shine. 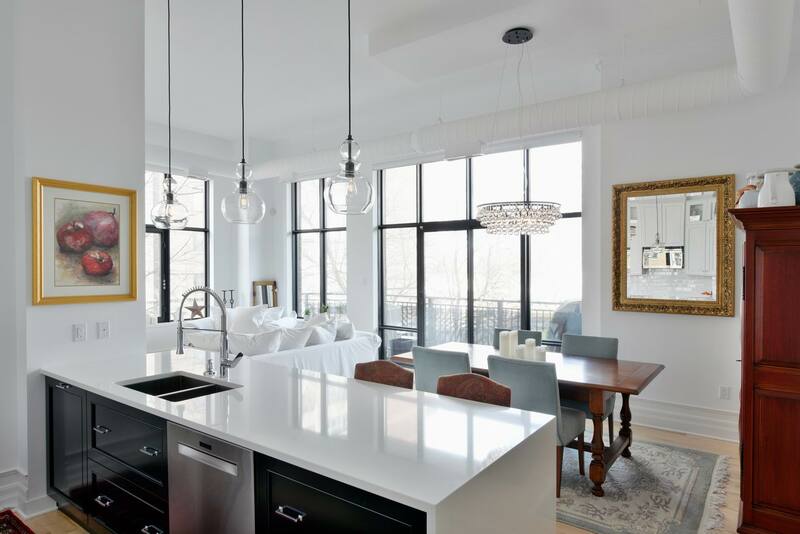 Classically feminine features throughout emphasize the owner’s style, including glass, mirrors, and gilded accents, while black hardware and the odd pop of colour break up the simplicity for a truly stunning and personalized home.